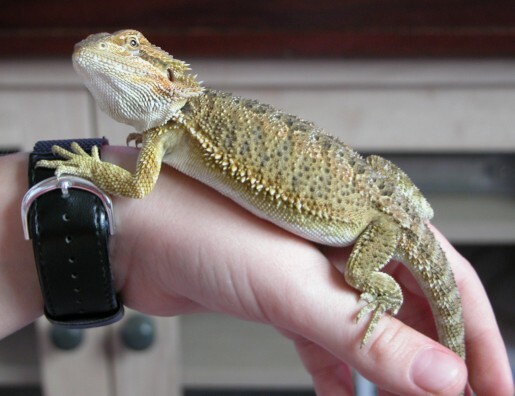 I'm often asked what size a bearded dragon should be at what age, which isn't easy to answer as they all grow at different rates. The rate they grow depends partly on genetics, and partly on the nutrition they are given. 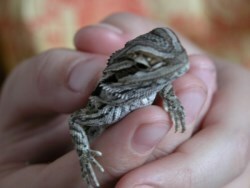 New owners worry their bearded dragon may be bigger/smaller than another. 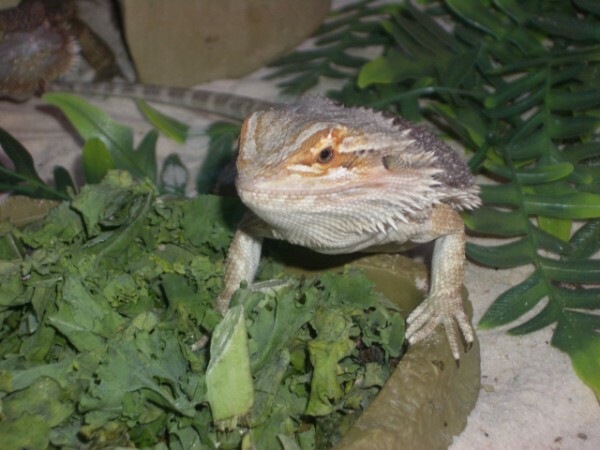 The best way of ensuring your bearded dragon is growing well is not to compare it with beardies of the same age, but to weigh your beardie weekly and make sure it has a steady weight gain. 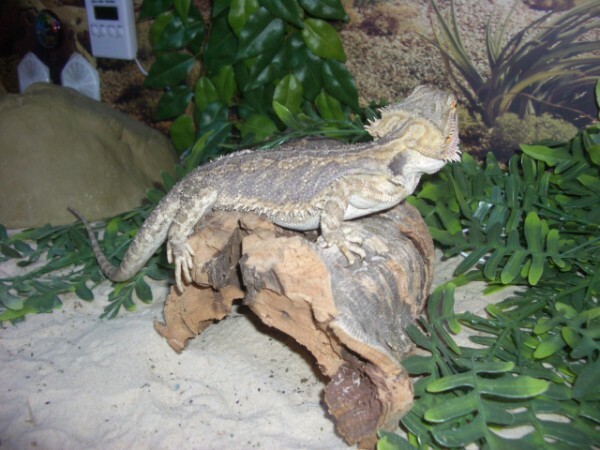 I plotted the growth of my bearded dragons from 4 weeks to adult - although other bearded dragons may grow at different rates, hopefully the pictures below will give you some idea of what to expect. 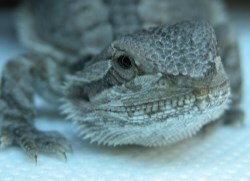 Bearded dragons grow an amazing 4000 times their birth weight during their journey to adult size. Some reach adult size well before their first birthday, others take 18 months to finish growing. These pictures below were taken on their first day with me. 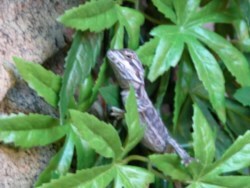 They are about 5 inches long at the moment (including their tail)! 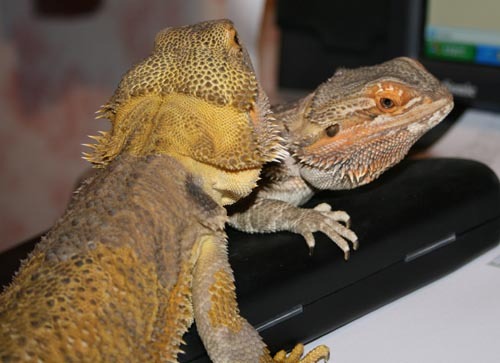 These pictures are of Shrek and Fiona shortly after I got them looking a bit lost in their large vivarium! Looking back now I can't remember them being this small! They seem very fragile and easy to hurt, and as a new owner I can remember being worried about whether they were eating enough! Soon thought they were eating me out of house and home! 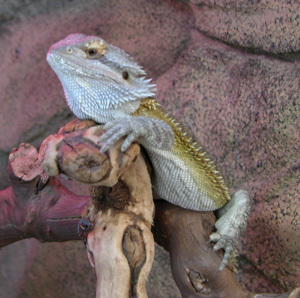 Bearded dragons grow and change at a very rapid rate - almost daily there seems to be a change. They seem to be in a constant state of shedding as they keep having to change their skin to keep up with their rate of grown. The picture to the right is Shrek at 6 weeks of age. He has become quite tame. The picture on the right was taken just one week after the pictures above (approx 7 weeks of age). 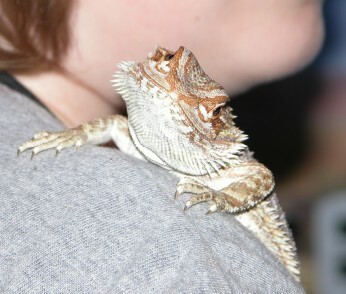 Shrek's head has become much broader, and he is starting to look like a bearded dragon rather than any other lizard. His limbs are starting to thicken up and to get that slightly chubby look that adult dragons have. Shrek and Fiona at 8 weeks. Shrek and Fiona at 8 weeks old. Fiona is now 8 1/2 inches long, and Shrek 8 !/4 inches. Compare these pictures to the ones at the top of the page to see how much they have grown! 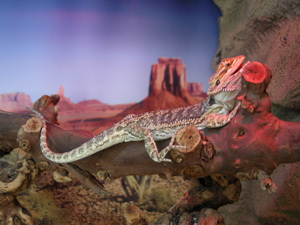 No losing them now in the vivarium! 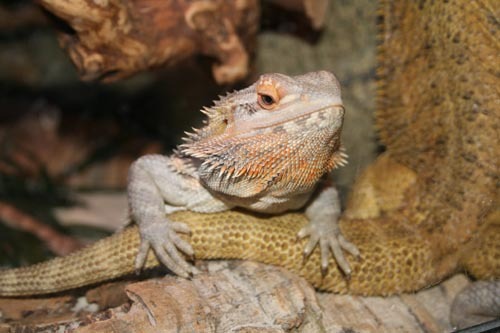 They seemed to get on very well together and were both eating veg and crickets. They do not arm wave quite so much nowadays though. Now 2 1/2 months old, and having been with us for 6 weeks, Shrek and Fiona have grown again. Fiona is longer, now being 11 inches, and Shrek slightly shorter at 10 1/2 inches. Shrek has a slightly stockier body. Apart from having grown a lot, their colours are really starting to show now. Shrek is a lovely green and gold colour, and Fiona more tan and orange. They are starting to look very different now as can be seen from the pictures below. 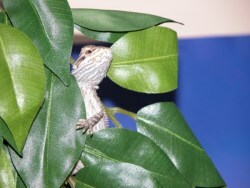 They are incredibly friendly, and seem to enjoy coming out of the vivarium! Shrek on left, sitting on Michael's hand. Shrek on left, and Fiona on right at 3 months old. 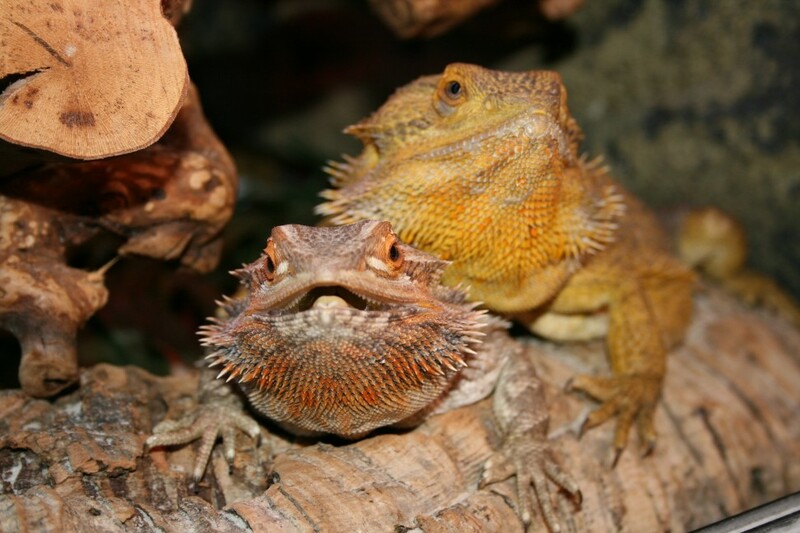 Taking on more and more adult characteristics now, Shrek and Fiona at 3 months old have started puffing out their beards and looking more like bearded dragons. At four and a half months old Shrek has now overtaken Fiona in size and is 15 inches to her 14 1/2. 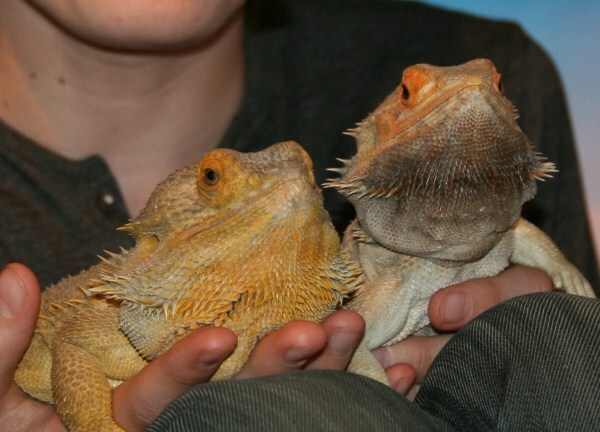 They are definitely male and female - Shrek looks decidely male, as you can see from the picture above left. His colour is getting more and more pronounced. Whilst not so colourful, Fiona (above right and to the left) has lovely markings. Shrek demonstrates head bobbing quite a lot now, and Fiona responds by arm waving. April 2007. Shrek and Fiona are now 9 months old. 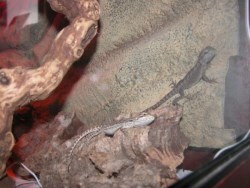 Shrek is about 17 inches long, and Fiona about 16. Fiona went off eating for a couple of weeks in her first winter and lost a bit of ground. Shrek is definitely very male, with a proud beard and large head. Fiona has a much more delicate heard and very pretty markings on her body. 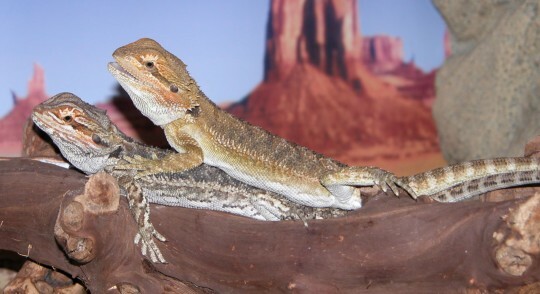 Neither had shed during the winter, but both are starting to shed again now (see the duller marks on Shrek's body on the picture to the left - he is just about to shed on his upper back and legs). Christmas 2006. 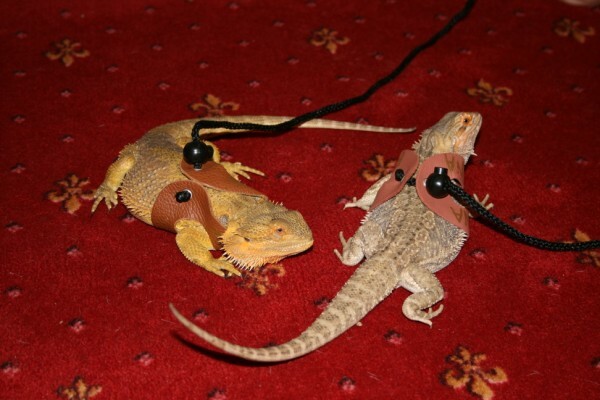 Shrek and Fiona are 6 months old, and for Christmas received leashes as a present! They took a while to get used to these at first, but then were happy dragging me all over the house! Unfortunately they like to explore in different directions so taking them out is a two person job! I was hoping that in the summer I could take them outside, but the summer to come in 2007 didn't offer a lot of opportunities to walk them in the garden! One year old - Shrek and Fiona celebrate their birthdays! At twelve months old Shrek was the biggest, measuing 18 inches in length, and Fiona was an inch shorter at 17 inches. Shrek is about twice as wide as Fi as well as you can see from the photos! 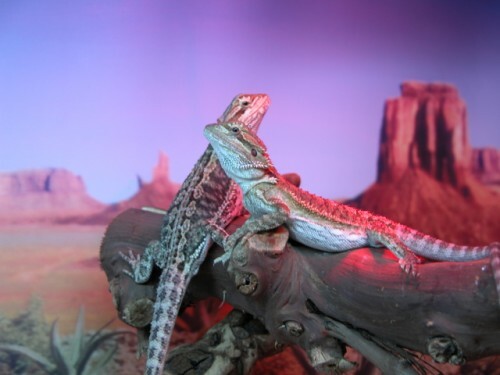 They both coloured up beautifully, their best colours appearing just after their favourite meal of locusts. Fiona likes digging, and deep holes in the sand can often be seen, but there is no sign of any sexual activity as yet. Shrek will head bob, and Fiona will arm wave back. If we head bob back at Shrek he will stop himself and looks a bit put out. They are very friendly happy to sit on my shoulders! They do have sharp claws though, and can give me a nasty scratch if I'm not careful. 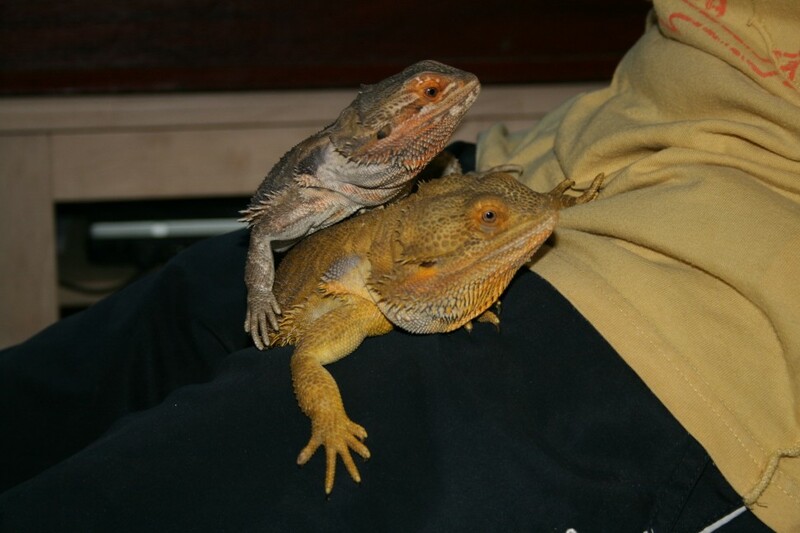 At 18 months Shrek and Fiona were fully grown. 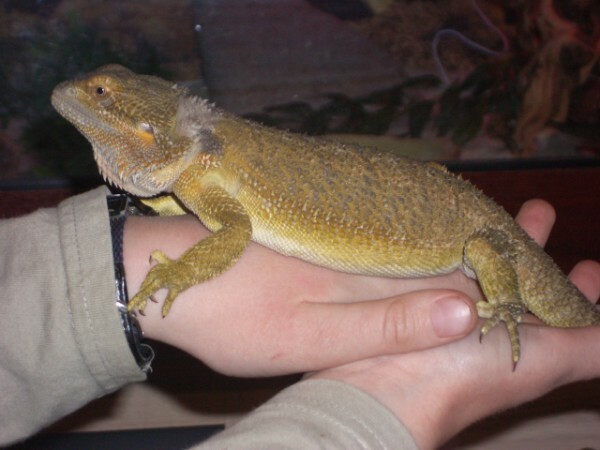 Shrek is a very big dragon, weighing just over 700 gms to Fi's 525 gms. . His size did worry me so I contacted Mike, his breeder, but was assured he just takes after his Dad, Max, who was also big. He doesn't have any more to eat than Fiona - in fact it's Fiona who'll attack the locust tub whilst he sits back politely waiting for 'lady's first'! He really is a hen pecked male, which is probably why I can successfully keep them together. 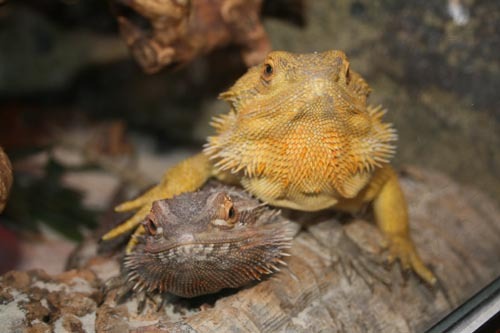 I was lucky with my beardies - but I really wouldn't keep two together again. Just in case.